Another novel about the war in Iraq might not be the tasty treat you've been craving but Ben Fountain’s absurd tale, the winner of the National Book Critics Circle Award and a National Book Award finalist, is an absolute must. The Pulitzer Prize Committee improbably chose not to award a fiction prize in 2012. This April they’ll be hard pressed to deny a winner with titles like Louise Erdrich’s The Round House, Kevin Powers’ The Yellow Birds and, yes, Ben Fountain’s Billy Lynn’s Long Halftime Walk all deserving of the prize. Fountain imbues Billy Lynn's Long Halftime Walk with a wicked sense of humor and a series of improbable events that sometimes make you laugh out loud. Such gallows humor allows the reader to continue to take in Billy’s tale and remain sane. You owe it to yourself and those who serve in your name to read this book. Don’t just skim it; devour it, embody it, make it a part of you. It deserves that attention. Summing it Up: Read Billy Lynn’s Long Halftime Walk because it will be one of the most important books of this decade. Read it because you can and because you’ll savor Fountain’s skill while wondering how you might react if one day you met someone like Billy. Read it because it’s so evocative that you’ll find yourself in the bowels of Cowboy Stadium with a hangover wondering who you are. Get on your knees and beg your book club to choose it so you can process it together. Nigerian author Chinua Achebe has died. His 1958 novel Things Fall Apart introduced a changing Africa to the world, The novel has sold more than ten million copies in fifty different languages. Nelson Mandela called Achebe, "the writer in whose company the prison walls came down." Using W. B. Yeats words “Things fall apart, the center cannot hold, Mere anarchy is loosed upon the world,” Achebe showed the falling apart of Africa while revealing the universality of humans in all times and places. 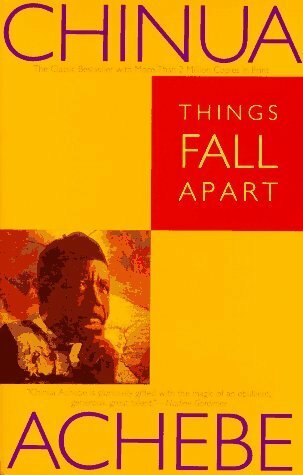 Things Fall Apart is the story of Igbo warrior Okonkwo and life in an Igbo village in the late 19th century when the white men arrived. While the novel is completely African, it speaks to all people especially in light of the last hundred years. If you haven’t read Things Fall Apart, honor Mr. Achebe’s memory and read it today. Choose it for your book club for a spirited discussion. It's impossible to be culturally literate without reading this book. 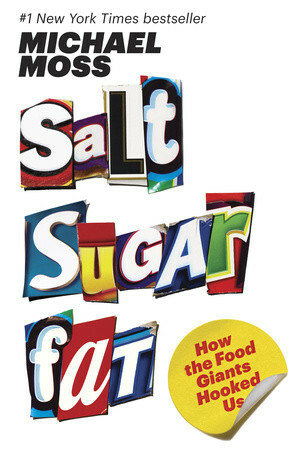 Reading Salt, Sugar, Fat is like devouring a murder mystery – only you’re the intended victim. Yes, a book packed with chemistry and research can be a page-turner. This book is as addictive as the foods it studies so the paradox is that readers are essentially learning about their own demise. That may not make it seem an appetizing read but the book is also similar to the “Choose Your Own Adventure” series you or your children may have read. Based on the information the book provides, you can choose which path to follow – that of allowing the food giants to hook you or of knowing their tricks and how to avoid them thus choosing a healthier life. This is not a diet book, a fad of the month self-help tome, nor is it an easy fix. It is instead the careful reporting of what’s inside the foods we eat. Michael Moss, a Pulitzer Prize winning reporter, is the father of two boys ages ten and thirteen so he knows that it isn’t easy to avoid processed foods. One of the beauties of this book is that he doesn’t preach and he never makes the reader feel guilty for consuming salt, sugar, or fat. Instead, Moss provides powerful information that will allow the busiest of us to make decisions about what we put in our bodies. He shows us that the food industry won’t change because salt, sugar, and fat are cheap, interchangeable, and they make food taste good. “They are huge, powerful forces of nature in unnatural food... They may have salt, sugar, and fat on their side, but we, ultimately, have the power to make choices. After all, we decide what to buy. We decide how much to eat. Kirkus Reviews calls this book “A shocking, galvanizing manifesto against the corporations manipulating nutrition to fatten their bottom line—one of the most important books of the year.” I thoroughly agree and urge everyone to read it and to choose it for your next book club discussion. Summing it Up: Read this book to save yourself and those you love from being manipulated by the food giants. Read it to learn how to avoid the progressively addictive attraction of the foods at eye level in our grocery stores. Read it because it’s an addictive treat that reads more like a bag of potato chips than a bunch of raw kale. 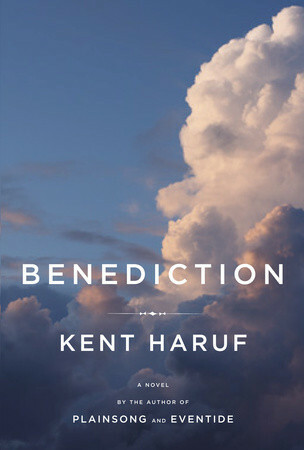 “Benediction – the utterance of a blessing, an invocation of blessedness” is the epigraph that opens Kent Haruf’s new novel. 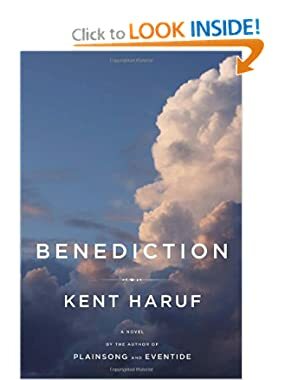 When I read the last page of this gem, I felt the "invocation of blessedness" in getting to share in the life of the quiet community Haruf has created in Holt, Colorado, also the setting of his acclaimed novel Plainsong. Like Plainsong, Benediction is replete with everyday characters capable of stealing your heart. When Dad and his wife, Mary, return from the doctor, she takes him a tray of food and a bottle of beer. “He looked at the beer bottle and held it in front of him and took a small drink. I might get me some kind of better grade of beer before I go. A guy I was talking to said something about Belgian beer. Maybe I’ll try some of that. If I can get it around here. Everyone in Holt calls Dad Lewis “Dad” even the employees at the hardware store he’s owned for decades. It’s an apt moniker as hardware store owners remain among the few who listen to our problems and offer us simple solutions or force us to face the reality that we might just need a bigger fix – just like our own “Dads” or the “Dads” we wish we had. Haruf’s writing provides the gift of making us feel that a man like Dad is someone we'd like in our own lives - well, most of the time. Food is an essential element in Benediction. In towns like Holt, people still bring food when someone is ill, still sit down together for meals, still have potlucks at church, and still tell people they love them by bringing them a covered dish. When Mary ends up hospitalized with exhaustion, neighbor, Berta May, arrives at Dad’s door with a plate of food and questions: “Are you sick or something? Are you going to die?” That’s how it is in Holt, Colorado; people get to the point and they take care of one another. After Mary’s hospitalization, daughter Lorraine comes home to help. She’s still not over the death of her own daughter at the age of sixteen in a long ago accident. Her marriage isn’t strong and she’s had no recent contact with her brother, Frank, who’s long been estranged from their father. Dad’s health fails and he begins to sit and watch the world from his window while contemplating the mistakes he’s made and savoring the love of the people around him. That Haruf has been a hospice volunteer is evident in the care with which he depicts the process of dying, death, and the details of lovingly caring for the terminally ill. Neighbor Berta May has taken in her eight-year-old granddaughter, Alice, after her mother’s death from cancer. Lorraine is drawn to the child but young Alice sees parallels in Dad’s condition that bring back painful memories so she tries to avoid the Lewis family. The Johnson women, an old widow and longtime church friend and her daughter, begin helping out and they take Alice on picnics, out for ice cream, and buy her a bicycle that allows her freedom and burgeoning happiness. The community church’s new pastor who’s been sent to Holt as a last-ditch maneuver for his “inappropriate” sermons offers companionship but then commits the cardinal sin of preaching on the Sermon on the Mount and expecting his congregation to believe it. “People don’t want to be disturbed. They want assurance. They don’t want to come to church on Sunday morning to think about new ideas or even the old important ones.” They certainly don’t want to be told to turn the other cheek and love their enemies. They call Pastor Lyle a terrorist and can’t understand why he doesn’t hate Muslims as they do. Only the Johnson women and a rule-bound usher stand by the pastor and the reader sees that Holt, like places everywhere, isn’t utopia. Holt is a metaphor for the universality of cities, small towns and suburbs where everyone must deal with living, dying, and accepting the hand we’ve been dealt. It’s easy to see that Haruf grew up as a preacher’s kid in a small town like Holt where people love and take care of each other but are often bound by the chains of small ideas, rules, and fear. The minor characters sins loom over the landscape and provide the reader with a deeper understanding of Dad and this community he so loves. My favorite play, Our Town, always reminds me that nothing matters more than this day. Benediction offers the same reminder wrapped in a package that allows us to see it clearly. Summing it Up: Kent Haruf is the master of the quotidian: celebrating and sharing the lives of ordinary people doing ordinary things. Read this novel to share in the rhythm of the land and the people and to rejoice that there are still writers who carry us with them into a world both completely familiar yet new enough to stun us into contemplating our own lives. Haruf’s writing is grace personified.